CITIES RISING: As the gears of federal government have ground to a halt, a new energy has been rocking the foundations of our urban centers. From Atlanta to Seattle and points in between, cities have begun seizing the initiative, transforming themselves into laboratories for progressive innovation. Income inequality, affordable housing, climate change, sustainable development, public health, participatory government—cities are tackling them all, bringing new urgency to some of the most vital questions of the day. Welcome to the age of big city progressivism! Cities Rising is The Nation’s contribution to the conversation. Sawant has called the meeting alongside the Gender Justice League to discuss a spike in violence, particularly against transgender women, in the rapidly gentrifying, historically gay neighborhood. She is asking the audience to suggest “neighborhood-based solutions” that she can advocate for. She’s the Seattle City Council’s newest member, elected in November 2013, and the Council’s only socialist—in fact, the only declared socialist in the legislature of a major US city. The crowd includes young gay, lesbian, and trans­gender people who live on the street, middle-aged career activists, and even Seattle’s mayor, Ed Murray, who briefly takes the podium to talk of his own activist history in that very church and neighborhood. Mostly, though, the elected officials listen as a group of activists speak. It quickly becomes clear that this event will not call for increased policing and stronger hate-crime laws; instead, speakers point out that hate violence often comes from the police. More than one speaker references the Black Lives Matter movement. Jackie Sandberg of Peace for the Streets by Kids From the Streets brings the crowd to its feet with a passionate call for an LGBTQ youth shelter. And speaker after speaker talks about the changes in the formerly queer-friendly Capitol Hill as it has become a trendy neighborhood for Seattle transplants. A few call for rent control. When Sawant rises to conclude the event, it is this call for rent control that she focuses on, along with Sandberg’s demand for a youth shelter. Sawant, who rode a wave of energy around the $15-an-hour minimum wage into office, is aware that fighting for her LGBTQ constituents goes beyond celebrating marriage equality. It includes, she says, tackling the problem of housing. “We hear it from people in the community, ‘We need to fight for LGBTQ rights, but, hey, listen, I’m a queer person and the housing unaffordability is hitting me hard—and who’s going to fight for me?’” she says a few days after the meeting. David Goldstein, a former staff writer at The Stranger newspaper who is now helping Sawant write her memoir, points out that most politicians treat their queer constituents as “a one-issue group,” but Sawant realized early in her campaign that her demand for rent control and higher wages resonated with a community that still faces housing and job discrimination. It has been part of her appeal to the working people of Seattle: that she understands their struggles to pay the rent and bills, that she realizes that the oppression faced by immigrants like her or transgender homeless youth intersects with the issues faced by a growing number of people in today’s economy, and that she is unwilling to subscribe to the conventional wisdom about what is politically possible. It is what made a liberal West Coast city already dominated by progressive Democrats vote to elect a socialist from an organization that calls for putting the top 500 corporations under public ownership. And it has helped to keep her popular despite complaints from business owners, mainstream media, and occasion­ally her own City Council colleagues that she is too divisive. Sawant is the highest-profile official in the United States to run as a declared socialist—Vermont senator and presidential candidate Bernie Sanders identifies as a democratic socialist, although he has never won an election as such—but she is following a well-trodden path. Socialists and other leftists have long played a prophetic role in American politics, challenging more mainstream politicians to be bolder. From Eugene Debs’s presidential campaign from an Atlanta jail to Sanders’s eight-hour speech in 2010 denouncing austerity politics and giveaways to the rich, socialists have demanded we face up to inequality and made us consider new ideas that were formerly unthinkable. “[Sawant’s win] changes narratives, it changes the realm of possibilities,” says Denechia Powell, a housing-­rights organizer formerly with the Tenants Union of Washington State. It is no accident that Sawant has emerged now, in this moment of acute inequality. The Seattle of 2015 is booming—perhaps less conspicuously than the Bay Area, but propelled by many of the same forces. Big tech companies like Microsoft and Amazon provide high-paid jobs for a select group of workers, who then buy or rent homes in trendy neighborhoods and send rents through the roof. But that boom is not hitting the city equally. “People are being displaced and pushed out away from their homes, their schools, their work, everything that they know,” says Powell. Enter Sawant. Big money and the Democratic establishment might find her demands unnerving, but her willingness to disrupt business as usual has helped the city accomplish a lot. “There’s something about [her] keeping us unsettled that forces us to do a better job,” says her colleague Mike O’Brien, a five-year City Council veteran. Several days after the All Pilgrims meeting, Sawant sits in her City Hall office, sharing thoughts on everything from the future of the left to her unexpected path to political office. Although she’s often portrayed in the media as a bomb-thrower, she comes across as warm and relaxed, smiling frequently, laughing easily. Behind her, George Orwell’s Homage to Catalonia and Barbara Ehrenreich’s Nickel and Dimed peek from a bookshelf, alongside books by Matt Taibbi, Glenn Greenwald, Eric Foner, and others. Alone at her desk, she seems less the fiery activist than the earnest professor, holding office hours. The seeds of Sawant’s own embrace of the “S” word were laid during her childhood in India, where she says she was “obsessed” with the problems of hunger and poverty. It was this obsession that sent her to North Carolina State University to get her PhD in economics, which she completed before moving to Seattle in 2006, and ultimately drew her to Socialist Alternative. The group is a small democratic-socialist organization from the Trotskyist tradition that describes its mission as helping to build an independent, working-class political party that could challenge Democrats and Republicans for power. Sawant had been seeking a political home when, in 2009, she heard a speaker from the group at a political meeting. “It was every­thing that I was thinking about,” she recalls. David Goldstein remembers when Sawant came into The Stranger’s office in 2012, seeking its endorsement for her run against State Representative Jamie Pedersen. Unlike what he calls the “clown socialists” they’d had in the past, she wanted to talk about issues—particularly revenue issues, deeply important in a state that has an incredibly regressive tax structure. The paper wound up endorsing her not in the race she had chosen, but as a write-in candidate against Speaker of the House Frank Chopp. She wound up getting 29 percent of the vote against the speaker. Socialists and other leftists have long played a prophetic role in American politics, challenging mainstream politicians to be bolder. That, says Sawant, was a “phenomenal result” for an openly socialist candidate, and from there Socialist Alternative cast about for its next step. It landed on the City Council, and 16-year incumbent Richard Conlin, whom Cruickshank describes as “a nice guy” who had pushed a “happiness initiative” at City Hall but had been the sole City Council vote against a paid-sick-leave ordinance. At this point in the conversation, Sawant deftly turns the subject from herself to organizing strategy, insisting that, tempting as it might be to focus on her story, “the electoral campaigns or having this City Council office is not about me, because it is so easy to tear down an individual.” It’s the kind of comment that could sound like false humility, except that Sawant’s rise really wasn’t about her, at least not entirely. 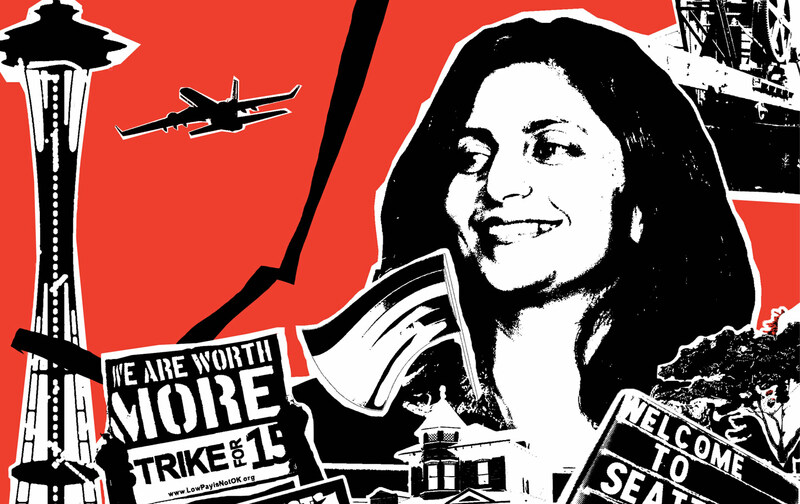 In November 2012, shortly before Sawant launched her campaign, the first fast-food workers had gone on strike in New York City, calling for $15 an hour and a union. Fifteen dollars an hour, Sawant says, felt like a number that would make a good political demand, something that came not from the minds of a small group of Seattle socialists but from a growing movement of working-class people. And closer to home, in SeaTac, a town of about 27,000 that surrounds the Seattle-Tacoma International Airport, a union-led campaign to organize low-wage airport employees was growing more intense. They too had decided to press for a $15 living wage, in their case through a ballot initiative. Ed Murray was the second candidate, after Sawant, to endorse the $15-an-hour demand, and it ul­timately helped him unseat the incumbent mayor. Buoyed by support for the minimum-wage increase, Sawant was also elected in November 2013. And close by, in SeaTac, the $15- an-hour ballot initiative passed as well. Crystal Thompson has worked at Domino’s Pizza for six years without a raise. Though she’s excited about the $15-an-hour win, she notes that it’s not going to solve all her problems. “Rent’s gone up, food’s gone up, prices have gone up everywhere. It’s pushing more and more people out of the city.” Thompson and her son share an apartment with a roommate; her son sleeps on the couch. In her quest to rein in these giants, Sawant can get wonky, going deep on everything from “linkage fees” paid by developers to strengthening tenants-rights laws. Rent control, for instance, is currently banned by Washington State law, but Sawant and Nick Licata, her Council colleague, are pushing to overturn that, recently hosting a massive town-hall meeting on affordable housing that needed two rooms to hold all the attendees. She and her staff are also researching the possibility of issuing city bonds to pay for thousands of new city-owned and -operated below-market-rate housing units. Denechia Powell, the housing activist, credits Sawant with helping to stop Stepping Forward, a plan from the Seattle Housing Authority that would have increased rents in public and Section 8 housing by more than 400 percent over a five-year period. Many of the tenants in public housing are immigrants, Powell notes, and for immigrant women in particular it was powerful to have Sawant rally with them. When she began to look into the utility Seattle City Light, Sa­want says, her staff found that big corporations like Boeing pay less per kilowatt-hour for electricity than an ordinary household. Instead of getting a bulk discount, she argues, Boeing should pay more—“from an economic-inequality standpoint, but, also, Seattle has conservation goals. How are we going to achieve those goals if big corporations like Boeing have no incentive to save energy?” The policy hasn’t changed yet, but, she says, one or two of her colleagues are beginning to agree. She did succeed, along with protesters, in preventing the CEO of City Light from getting a possible $120,000 more per year (he already made around $245,000). The biggest criticism of Sawant, mostly from her right, has been that she is an outlier, or too divisive to accomplish much. “She hasn’t changed anything,” David Meinert, a business owner who was part of the panel that worked on the minimum-wage bill, told The Seattle Times. “She’s barely cast a vote that’s made a difference.” Sa­want’s opponent in the upcoming City Council elections, Urban League of Metropolitan Seattle CEO Pam­ela Banks, criticized her style, saying, “I’ve learned over my career that you solve more problems with a telephone than a megaphone.” More recently, The Seattle Times wrote that “Sawant’s slash-and-burn style is as unbecoming as it is ineffective,” in response to a battle over the replacement for departing City Council member Sally Clark. As Sawant’s first reelection fight approaches, changes in Seattle’s election process are leading her to stress this side of her politics. At the same time that voters in Seattle threw out their incumbent mayor and voted in a socialist in 2013, they also voted to change the way the nine-member City Council is elected. Previously, Council seats were citywide, but now seven members will come from districts, and they’re all up for reelection in 2015. Sawant supported the measure, and is running in District 3, which includes Capitol Hill. It’s not yet clear what kind of impact the shift to district elections will have on the City Council—or on Sawant’s prospects. She made her name on citywide issues that have national resonance, but with district elections, Mike O’Brien notes, issues like potholes and crosswalks can crowd out big-picture discussions about inequality. However, district elections also make it easier to win with less money, through door knocking and local meetings like Sawant’s LGBTQ forum, allowing progressive candidates to connect with voters on issues that mean a lot to them. The short period between elections means Sawant has had less time than other candidates to prove her worth. Yet, despite the lingering criticism that she is too “militant” for Seattle, Robert Cruickshank believes she’s won over the city’s progressives. Her Council district overlaps two state legislative districts, and Democratic groups in both districts voted not to endorse a Democratic challenger. Because she is not part of the party, she is ineligible to receive the party’s endorsement, so her supporters campaigned instead for a non-endorsement—and got it. Despite the support she gets from Democrats, though, Sawant is adamant that the Democratic Party does not serve the needs of working people. Before he’d announced his presidential campaign, she called on Bernie Sanders to run as an independent rather than within the Democratic Party. “Victory in 2016 for the US left would be for somebody of the stature, name recognition, and the confidence that people have in him, somebody on those credentials running an absolutely bold independent working-class challenge to the big-business candidates,” she says. “It’s not going to happen overnight,” she notes. But it’s a start.